Last week, I tried to go to the Botanic Gardens at Cranbourne near Melbourne but, with the extreme heat and drought, the gardens were closed due to fire danger. Fire, heat and drought are tremendously potent issues throughout most of Australia these days, after nine years of drought conditions. 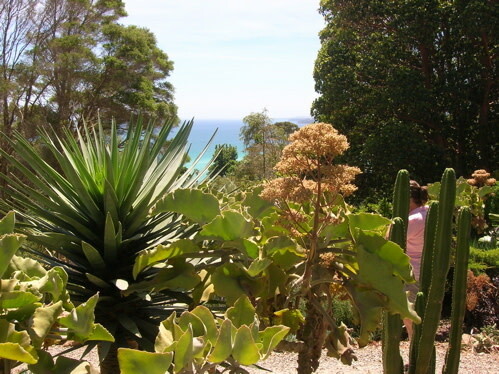 My intrepid group of friends and family, including my energetic, plant-loving, 86 year-old dad, decided to head south down the Mornington Peninsula to another garden in Dromana, the home of the "other" Heronswood. To the horticultural cogniscienti of North America, there was only one Heronswood – the now-closed Heronswood Nursery in Kingston, Washington, founded by superstar plant explorer Dan Hinckley and his partner Robert Jones. A true plant Mecca, it was bought by seed giant Burpee but lost much of its elan without Hinckley’s expertise. However – getting back to plant travels in Australia – there is another Heronswood – albeit completely unrelated – in Dromana, Australia, a town on the southern edge of Victoria’s Port Philip Bay, about an hour south of Melbourne. 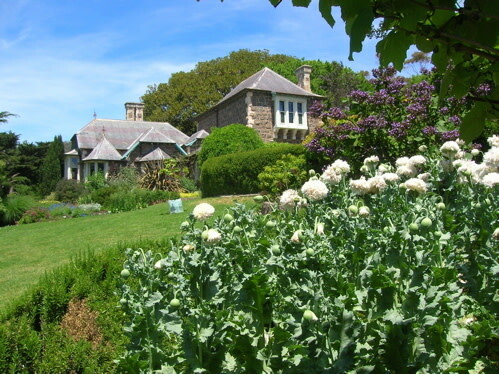 The beautiful stone house at Heronswood was built in 1871 and is now on the historic register. Diggers Nursery was built on the property in 1978 by founder Clive Blazey who had a plan to save old vegetable varieties, which were being dropped off seed lists in favor of new hybrid varieties. 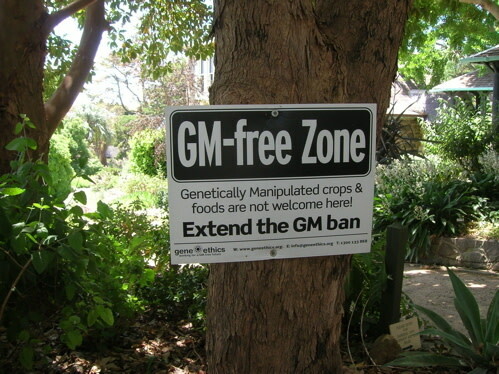 "Growing our own uncontaminated food is not a new concern, but one that goes back to the 17th century Diggers in England. The original Diggers, inspired by their founder Gerrard Winstanley, seized public land with the aim of growing food to give away to the poor. Their crime was simply planting vegetables on common land but it was met with a force of troops at the request of land owners. The first Australian reference to Diggers came in 1853 during the gold rush. United in rebellion the Diggers rose up when forced to pay unfair taxes. 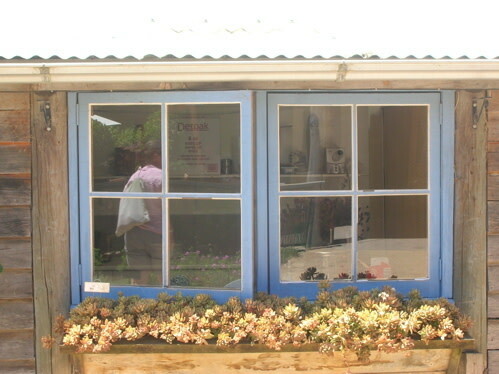 This sparked the Eureka Stockade, so to be called a Digger was to describe a subversive mate who shared the common cause…"
In this politically engaged spirit, book author and nurseryman Clive Blazey runs a "climate-positive" nursery devoted to preserving valuable heirloom edibles. I enjoyed reading their list of green initiatives including driving fuel-efficient cars, buying renewable energy, gardening organically, using organic food grown from heirloom seed, cutting water bills, and more. Environmentalism is a serious business for many Australians, especially given the severe water restrictions currently being practiced in many states. 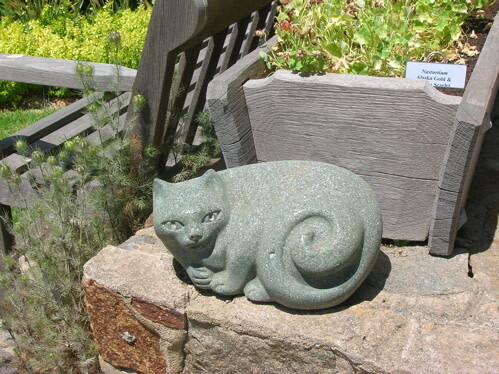 There’s a shift occurring in Australian gardens, from primarily English-style rose and flower gardens to more drought-tolerant plants including Australian native plants, long considered worthless scrub to Anglophiles. 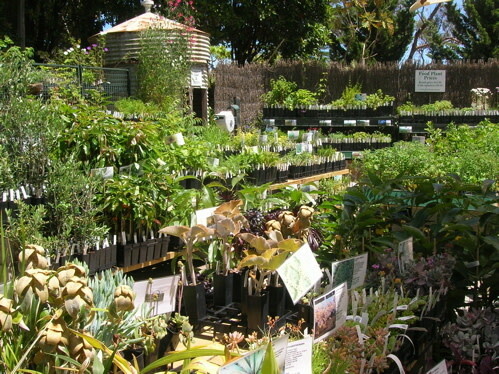 The Heronswood garden and Diggers Nursery in Dromana is a required stop for garden lovers visiting the Melbourne area. In addition to Heronswood’s display and demonstration gardens with sweeping views down to the bay, Diggers plant nursery and shop, and the excellent restaurant Fork to Fork, there’s the rest of the Mornington Peninsula, a respected wine-growing region of its own. The combination of the beautiful surroundings, the salty air, the beautiful local gardens and the wineries with their magnificent lunches makes the Mornington Peninsula a beautiful day or weekend trip. Across the bay, the City of Melbourne can be seen across the water on a clear day. 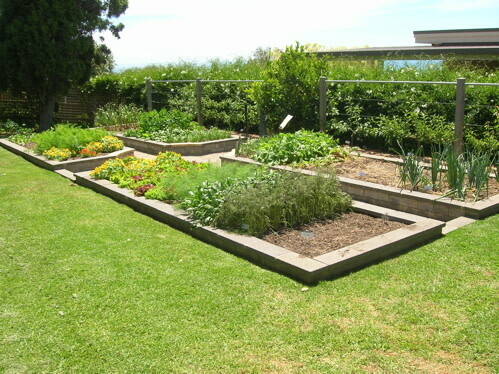 This garden demonstrates the idea that vegetables can be produced year-round for a family of three in a very small plot of land if proper succession planting is used. 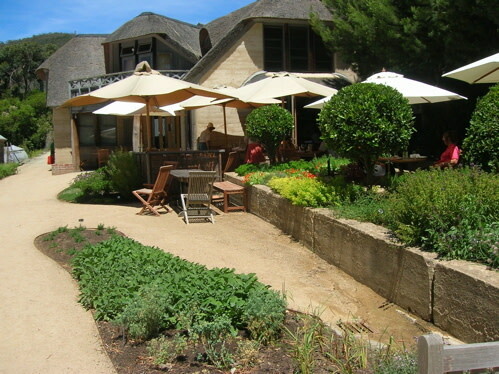 The restaurant Fork to Fork offers lunches with organic, seasonal produce, mostly from the Heronswood gardens, as well as locally produced meats, fish, cheeses and wine.